Indoor mold buildup is unsettling for any Aududon Park, NJ home or business owner. Due to the nature of mold and how it spreads, it can easily spread and jeopardize your property value and your family’s health. The MasterTech Environmental mold remediation team recognizes that, when it comes to mold, immediate, safe and efficient action is the best practice. When it comes to mold, a bad mold remediation can actually make problems significantly worse. That is why at MasterTech Environmental, we promise the job done right the first time. As proof of our commitment to you and your family’s health and safety, MasterTech offers a 5 year mold-free warranty with every Camden County, NJ Mold Remediation. When confronted with mold, the first course of action would be to call a professional to complete a mold inspection of your Audubon Park, NJ property. Your MasterTech inspector will complete a comprehensive visual analysis to isolate any and all conditions that could be promoting mold proliferation. Your inspector will identify potential causation through moisture mapping with moisture meters and thermal imaging cameras. Diagnosing causation will be vital to future prevention. If necessary, your inspector will retrieve test samples to be analyzed by a third-party lab for further scientific support. Following a complete mold inspection, your inspector will be able to compile all the findings into a clear and concise report. You will be presented your report with a full walk-thru and discussion of all the findings. If deemed necessary and if requested, your inspector will draft a detailed scope of work for mold remediation. If a mold remediation of your Audubon Park, NJ property is completed incorrectly or poorly, you risk further damage to your property and worsening health effects due to further mold exposure. 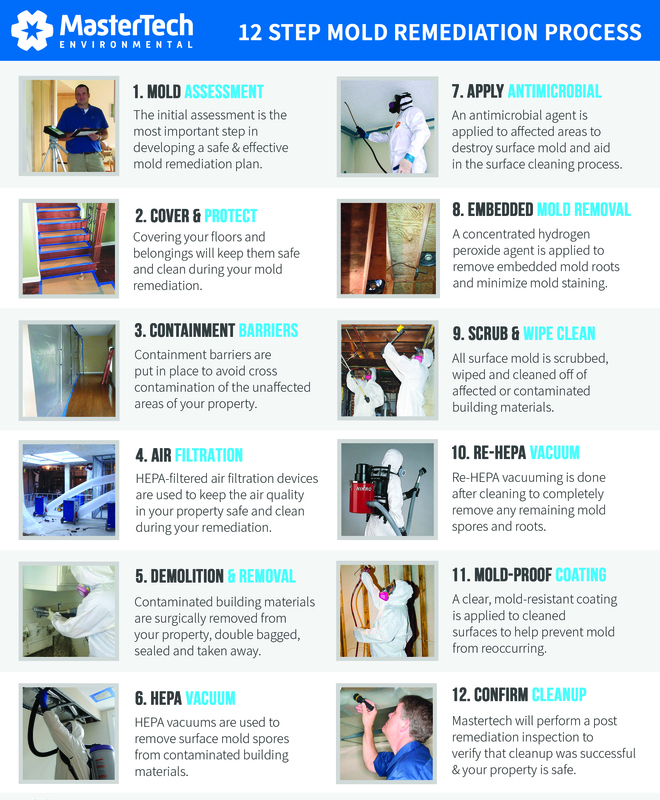 MasterTech has taken time and care to meticulously design a step-by-step Audubon Park, NJ mold removal process that incorporates the safest and most efficient mold removal methods and technologies to ensure that you receive an effective mold remediation the first time. The first step in any mold remediation should be to diagnose causation. For a successful mold remediation, it is crucial to identify and deal with the underlying water issues that is promoting fungal activity in your property. Prior to any remediation, your MasterTech inspector with complete a comprehensive assessment of affected areas and all surrounding areas. Using moisture meters and thermal imaging cameras, your inspector will be able to analyze the full extent of the water problem in the most non-invasive way possible. As long the water source is properly address, the chances of re-occurrence will reduce greatly. In cases where the property has experienced significant water intrusion, MasterTech may need to complete a full NJ water damage restoration and structural drying before even considering the mold remediation. Once airborne, mold has a habit of spreading to unaffected areas. Mold spores, that are carried in the air, threaten you and your family by putting them at risk of respiratory allergies and distress. Furthermore, mold spores in the air can land and root themselves in new, clean building materials. In order to reduce cross-contamination, the MasterTech crew is trained to be extra cautious when erecting containment, as to not overlook any vulnerable spots for mold spores to potentially escape. Mold can be safely removed from most surfaces of your Audubon Park, NJ home without the use of toxic agents. 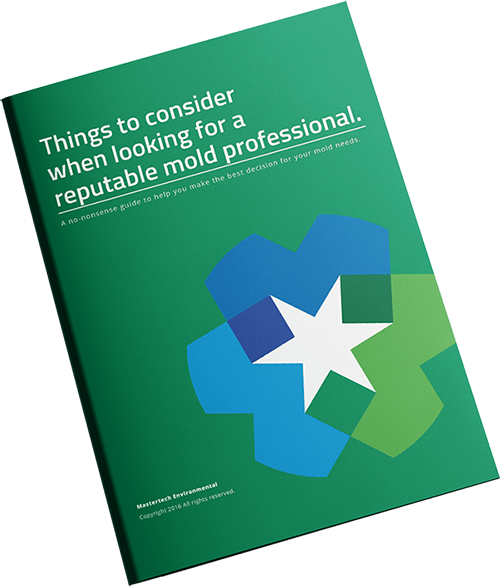 In some, more aggressive, mold infestations, contaminated materials may be non-salvageable and will require safe removal and appropriate disposal. MasterTech technicians are trained in the most advanced techniques for the safest, most effective, and most efficient removal and disposal of moldy materials. Our mold removal method incorporates modern oxidative technology. Biological organisms require a unique decontamination protocol designed specifically to remove and prevent its growth. The use of oxidative technology for mold remediation in Audubon Park, NJ has revolutionized the mold industry. Prior to the inception of this technology, industry professionals relied on hazardous abatement methods that were developed in the 1980s. MasterTech has made an effort to craft the safest, most effective, and most efficient mold removal process using the methods available, and we are constantly researching newly developed methods, to ensure that our process stays the safest, most effective, and most efficient. If you suspect a mold problem in your residential or commercial NJ home, call MasterTech Environmental ask about mold removal in New Jersey. For mold inspection in Pennsauken, NJ or mold remediation in Berlin, NJ call 1 (800) 310-3226 today. Our mold inspectors will be happy to walk you through our process, answer all your questions, and schedule an appointment for you.